A programmable 72 individual input interface that connects to the computer’s PS/2 keyboard port. The KE72 receives power directly from the computer’s PS/2 keyboard port, no external power is required. A pass-through port is provided to allow for full use of the user’s PS/2 keyboard. Use independently or simultaneously with the KE72 unit. Easily programmed from a simple text file and stored on board the KE72 in non-volatile memory. KE72-T Option converts trackball signals into PS/2 mouse protocol and inputs are available for the Left, Right, and Middle mouse buttons. RS-232 serial port receives ASCII characters and outputs to the PS/2 keyboard port. 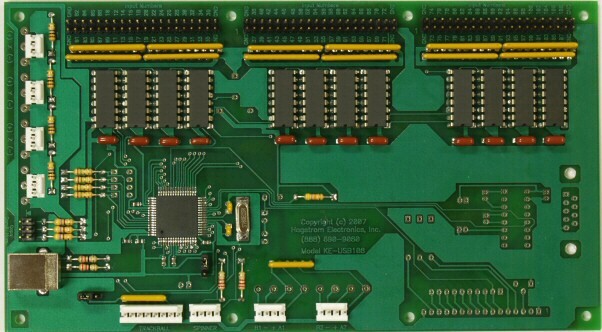 The KE72 serial port is 9600 Baud, 8-bit characters, No parity, and one stop bit. No hardware handshaking is used. Custom versions are available, please contact us with your requirements! Inputs may be programmed to emulate a single keystroke or a macro sequence of keystrokes. Each of the 72 inputs has the capability to send up to 32 keystrokes when activated and up to 16 keystrokes when deactivated. Super-fast scanning assures top speed responses to each of the inputs. A header is provided for connection of status LEDs for Num, Scroll, and Caps Lock indicators. Supplied with a printed user manual and disk containing computer applications which are used to configure the unit. The KE72-T option is the same product as the KE72 but provides a trackball input for the unit. The trackball option adds PS/2 mouse functionality to the KE72. Trackball input will create mouse cursor movement. With the KE72-T option, inputs are available for the Left, Right, and Middle mouse buttons. 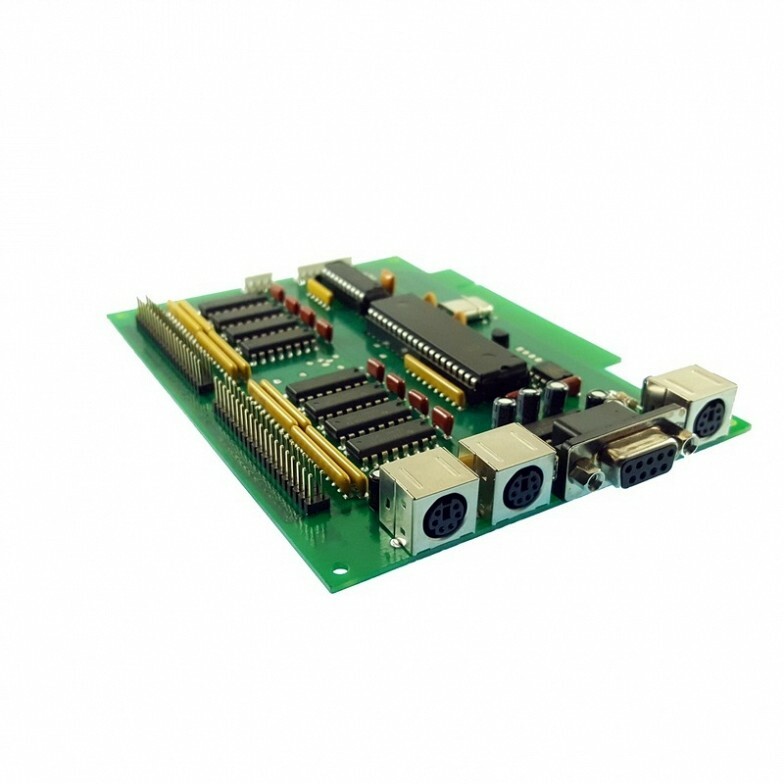 A programmable PS/2 keyboard emulator with 72 individual switch inputs! 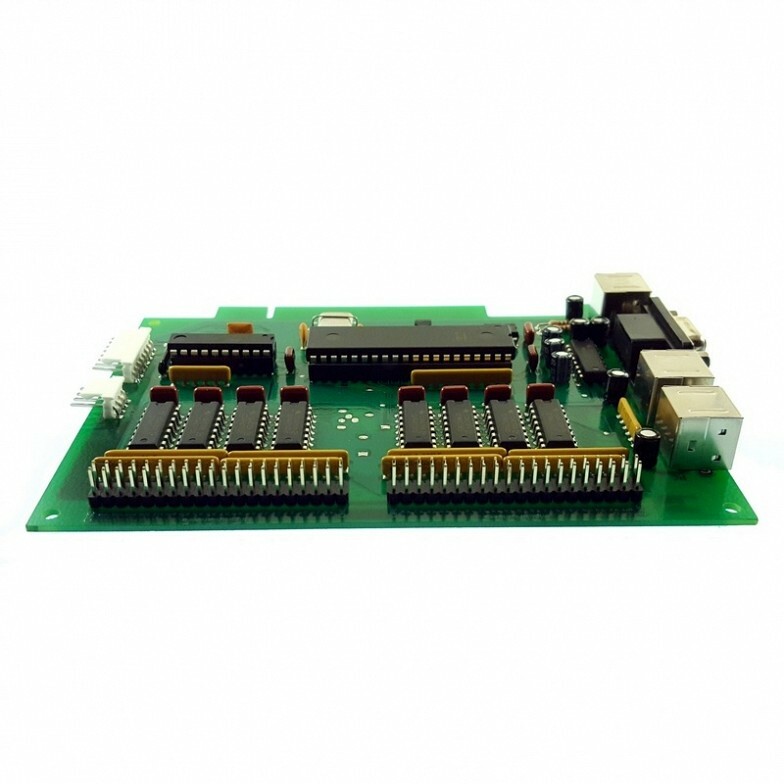 The KE72 is a programmable device that emulates a PS/2 keyboard. 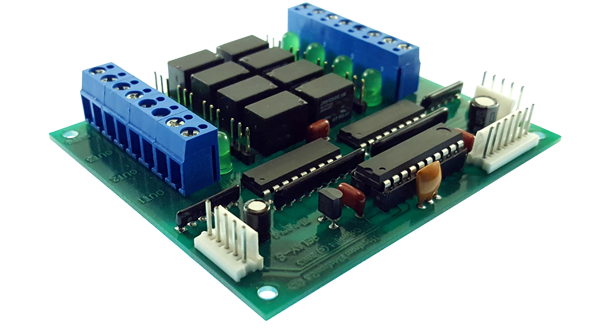 This unit provides 72 individual inputs for switches and other switching devices. A pass-through port is provided for a PS/2 keyboard which allows full use of the user’s keyboard. An RS-232 serial port is featured on the KE72 as well. The KE72 receives power directly from the computer’s PS/2 keyboard port, so no external power is required. This unit is the ideal device for Flight Sim and Computer games. Each of the 72 inputs may be programmed to emulate a single keystroke or a macro sequence of keystrokes. In addition to sending keystroke actions when and input is activated, keystrokes may be sent when an input is deactivated. Each of the 72 inputs has the capability to send up to 32 keystrokes when activated and up to 16 keystrokes when deactivated. Super-fast scanning assures top speed responses to each of the inputs. Individual inputs on the KE72 are activated by connecting the input to the common logic ground on the KE72 input header. Use any type of switch that produces a contact closure. The KE72 can accept inputs from pushbutton switches and/or toggle switches, in addition to logic level outputs - provided they are active low and do not supply current into the input. The inputs may be programmed to send a response when the input is activated, when it is de-activated, or both, making the unit ideal for handling toggle switch actions! All 72 switch inputs are individual inputs, no matrix scanning is required. Since all inputs are individual, there is no chance of "phantom" keys that are inherent in scanning a matrix. With the individual input configuration, any combination of inputs may be activated simultaneously during operation. All the inputs share the same common logic ground. A header is provided for connection of status LEDs for Num, Scroll, and Caps Lock indicators. Connection to this LED header is not required, but the status feedback is useful for many applications. 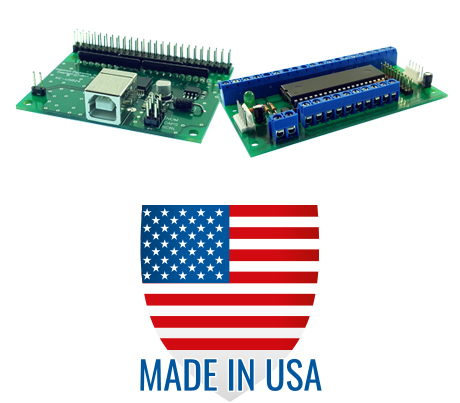 In addition to sending responses as PS/2 keystrokes, the KE72 may be programmed to send RS-232 responses to input actions. 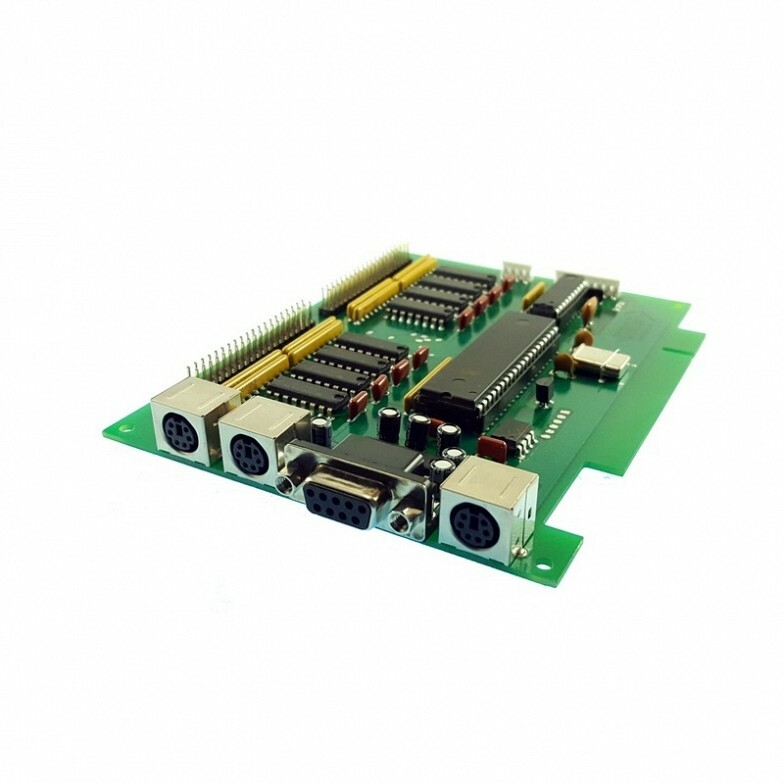 The KE72 flexibility allows for responses from each input to be sent to either the PS/2 port or RS-232 serial port. The RS-232 serial port will accept ASCII characters and produce their equivalent PS/2 keystrokes on the computer. For example, if an ASCII “a” is sent to the KE72 serial port, a keystroke sequence to produce the “a” character on the computer will be generated. All serial data in and out of the KE72 serial port is always at 9600 Baud, 8-bit characters, No parity, and one stop bit. No hardware handshaking is used. Custom versions are available, please contact us with your requirements! Programming the KE72 is done by creating a simple text file that defines the desired responses for each of the inputs used. A program is provided which interprets the text file and programs the KE72 responses based on that configuration file. 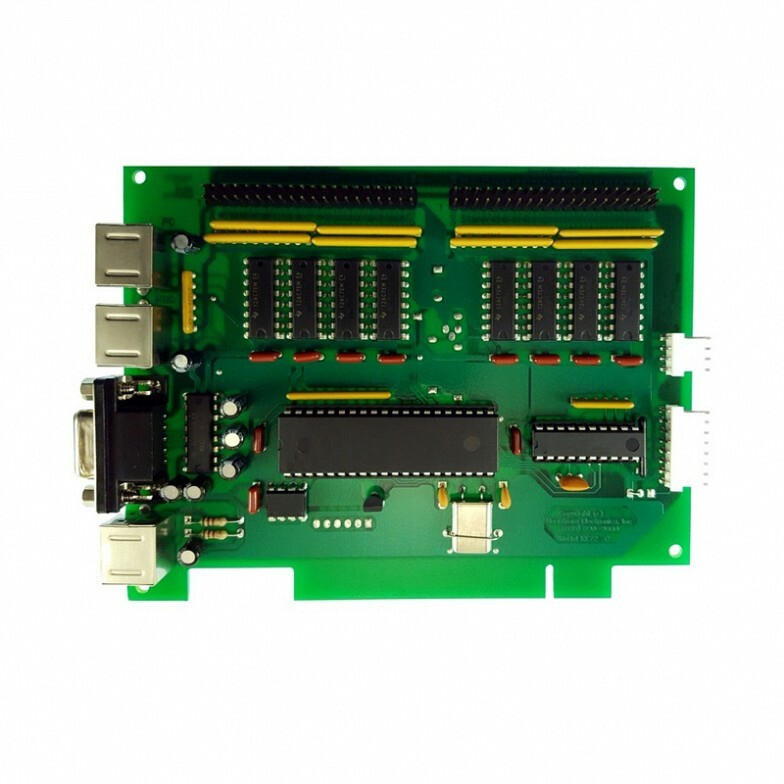 The configuration for the input responses is stored on board the KE72 in non-volatile memory. This memory is maintained until the configuration is changed again by the user. The KE72 is supplied with a printed user manual and disk containing computer applications which are used to configure the unit. Sample text files are also included with the KE72 documentation as a quick start to developing a configuration. 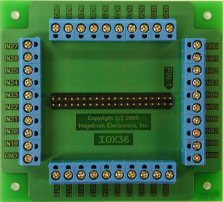 IOX36 – Breakout Board plugs onto either of the two input headers on the KE72. Each IOX36 provides screw terminals for 36 inputs. For connection to all 72 inputs, two IOX36’s will be needed. 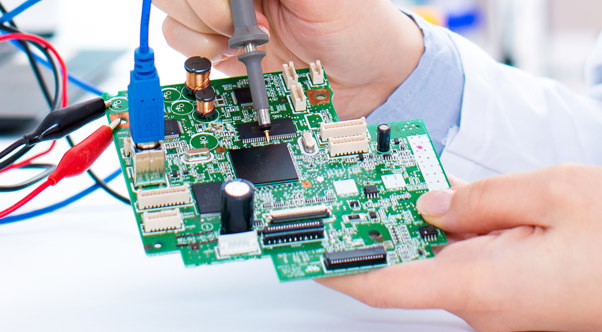 Each IOX36 includes an 18-inch ribbon cable for connection to the input headers. KE-MM6-mini - Male to Male PS/2 style cable to connect from the KE72 to the computer’s PS/2 keyboard port. Length = 6 feet. Note: An additional KE-MM6-mini will be needed for the KE72-T to connect from the KE72-T to the computer’s PS/2 mouse port. KE-DB9MF - Male to Female RS-232 DB9 style serial cable to connect from the KE72 to the computer’s RS-232 serial port. Length = 6 feet. *KE-TBH3 – Use with the KE72-T only. Keyboard encoder to trackball connecting cable. Length = 3 feet. *KE-SP3 - Use with the KE72-T only. Keyboard encoder to spinner connecting cable. Length = 3 feet. *Custom lengths up to 10 feet are available. Please contact us for pricing!